This race is perfect for competitive runners as well as casual runners/walkers. The course is USTAF certified, and the race will include chip timing. All participants will enjoy the opportunity to join their community in supporting a great cause and the chance to take in the local scenery. Both the 5K and 1-mile race courses start in downtown Medford in front of the Public Safety Building (rain or shine). The course winds through town, and then moves out to surrounding country roads. Pick up your race packet between 7AM– 8AM on Monday, September 2nd. Pre-Race Day Fees: Register online by Friday, August 30th, or drop off registration forms at ShopRite of Medford – Courtesy Desk 208 Route 70 East, Medford, NJ by Friday August 30th. NEW THIS YEAR: Computerized self-registration stations help streamline Race Day registration! Team Discount – Receive a $5 discount per person when registering 3 or more participants for the 5K. Simply select the “5K Team/Family” registration choice. Parking: Find parking at the Public Safety Building (Police Station) and at Freedom Park, just across the street. Stretching: Come early and join us for some stretching from 7:30 – 8:15AM with DAVIS PT, a local leader in physical therapy and sports rehab (www.DAVISPTSR.com)! Stretching is critical before running or walking! WHEN YOU REGISTER EARLY…you’ll receive an A4 Cooling Performance shirt. The shirt will also be available to race-day registrants while supplies last. To guarantee your shirt size, register by August 26, 2019. The first 250 registrants also will receive a drawstring backpack with perks inside. Register as a team to enjoy a friendly competition among family, friends and co-workers, or compete as a high school team. The top 3 members of the top Friends & Family and High School teams will receive awards. All team members save $5 when registered online by Friday, August 30th. All teams must pre-register online for the team competition. ** Using times of team members, the top three members will be awarded. Make Race Day Better! 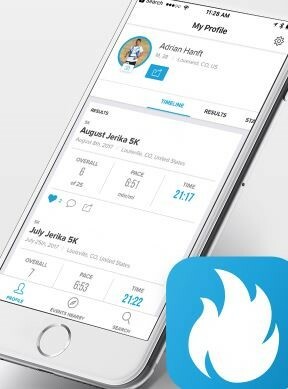 With the Athlinks App, you’ll get race updates, finisher results, and YOUR personal stats sent to your phone. Athlinks even collects your reported race times from the past 10 years so you can see all you’ve accomplished. Search for other events, challenge friends, and set goals with the Athlinks App. Download it here. Additionally, on Race Day, LINMARK Sports will set up laptops for paperless walkup entry and instant results lookup. All overall awards will be scored on Guntime. All age group and team awards will be scored on chip time. There is no need to jostle for position at the start of the 5K – your official time does not begin until you cross the start mats. The latest timing technology is provided by LINMARK Sports with videos of your finish. A4 Cooling Performance shirts are guaranteed for pre-registered participants. Register by August 26, 2019 to guarantee your size. Nylon drawstring backpacks filled with snacks, coupons and more will go to the first 250 pre-registered participants! Look for the KIND tent to score free KIND bars. Gary Pringle “The Balloon Man” from Premier Parties will spin some heart-pumping tunes and create truly remarkable balloon art for the kids and those young at heart! Davis PT will lead stretching to help all participants get ready to run, walk or even dance to Gary’s music.